"What book should I get?" seems to be one of the most popular questions on the mailing lists for both Ruby and Rails. I like to think that I stay on top of the Ruby and Rails book market, and so I thought I'd prepare a few bibliographies or curriculums or, if you like, big fat lists of books. I suggest following these in order for the most part, but if you're wild and crazy, feel free to ignore that. Note: The title links are affiliate links; if you don't like that, then the links provided after the information are non-affiliate links. I suggest these two because they're slim volumes; you don't need a lot of coddling if you already know the basics of programming. Most of your questions will not be "How do I do (x)?" but "How do I do (x) in Ruby?" 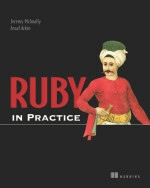 Again, the smallest Ruby books that are good because PHP guys probably won't be as interested in learning Ruby as they are learning Rails. I just started these books, but I think they're going to turn out to be excellent overviews of the structure of computers. So many times we get caught up in our abstractions, we forget there's a machine under there, and our code would probably work better if we thought about it once in a while. A free version of the Pickaxe. This version is based on Ruby 1.6 (we're at 1.8.6 now), but most of it still holds true. The Ruby API documentation is a great reference; this is more up to date than the reference in the free Pickaxe. Sitepoint's Rails book is free for a little while longer, so you'd better grab it while you can! The Rails API documentation is more up to date than the Rails book, and the Caboose version of the documentation is generated often to keep up with recent changes in Edge Rails. And that's it! Let me know of any suggestions you have and I'll consider adding them. Lots I need to blog about, and so little time and energy to do so! For this entry, though, I'll just mention that my book Ruby in Practice is now in the MEAP (Manning Early Access Program). So that means you can grab a PDF copy of the 2/3 of the book we have done (1/3 is posted now; next 1/3 should coming any day now) and help me edit it, work out bugs, insult me, and/or, hopefully, get something out of the content. Now that you've heard me beg for you to buy it, go do it! If you can't tell, I based the aesthetics of the analyzers on RSpec specs. They are nicer, but they should probably reveal less of the guts of dcov. Enjoy and please e-mail me, IM me, or comment with any bug reports or problems. Or you can use that silly bug tracker thing. This weekend a couple of friends and I competed in the Rails Rumble, developing, what I think to be, a solid product (even though it currently has quite a number of rough edges). We call it Conduit, a communication application that lets you send messages from one interface and have them delivered over the medium of the receipients' choice (currently, AIM, IRC, e-mail, SMS, Campfire, Jabber, and Twitter are available). The basic mechanism is that you create an account, invite users, create channels (such as "Design Team" or "Beta Testers" or "The Wife's Family"), the confirmed users subscribe to these channels, and then the messages sent over those channels are doled out to all subscribers over their preferred communication medium. So if you send a message to your Design Team channel, Mike can get it on AIM, Ralph over e-mail, and you know Alice spends half her day on Twitter. Go ahead and vote for us when the voting opens on Wednesday! Let's hope we win. We won't find out, though, until RubyEast in Philadelphia at the end of this month. I'll be speaking, giving The Humble Little Ruby Talk, an introduction to Ruby. This will be followed up by Amy Hoy's introduction to Rails, so if you're a Ruby newb or a Rails neophyte, you should go register up. Even so, if you're a seasoned vet, a lot of the talks look really interesting. Head on over to the conference site and take a looksie at the talks and maybe even the registraiton page. While working on the Rails Documentation Project, it's been interesting to see the veritable array of documentation styles and conventions present in a single (albeit, open-source and slightly heterogeneous) code base. Sometimes the options hash is documented fully, other times it's not. Sometimes they document it once at the head of the class, sometimes it's for every method. Sometimes they put one sentence that is essentially a humanized method name (e.g., check_box_tag = "Makes a check box tag"), sometimes they include an entire essay about the method. Of course, it isn't unique to Rails nor open source, but Rails is the first project where I've combed through the documentation from front to back (and, of course, side to side, because you know how I work it). But what about conventions? One of the things I've learned from those who do "technical writing" as a career is that they typically have quite rigid standards, styles, and conventions to follow when writing. Whether it's a style guide that indicates which case of a verb to use in every instance or a specification that dictates the structure of every piece of documentation, the "real world" of technical documentation isn't as free wheeling as we like to treat it, and this cavalier treatment of documentation is one reason that Rails (and, to an extent, Ruby) isn't taken seriously by a large portion of "corporate" entities. First question anyone will ask when considering using a technology is, obviously, "How do you learn how to use it?" Obvious answer: the documentation (less obvious, blogs, mailing list, talking, training, and so on, but the most obvious and useful answer is the documentation). If your documentation looks like a hodge podge of documents that have been scraped from a blog, then how can you expect anyone to take it seriously? Compare that with the documentation for the .NET framework, Python, or a lot of larger Java projects. They have conventions, and I think we should take a careful look at what they do with them. First, they enforce documentation for every piece of code. Nothing goes in the framework or project that isn't documented. Granted, some things don't need documentation (thanks :nodoc:!) because they don't need to be used by anyone but the framework, but anything that is exposed and usable, should be documented. I'm using the term documented in a very specific meaning here: not the loose context that people consider "documented." Documented is not humanizing the method name or stating the obvious. Documenting is connecting what a functional unit of software does with how to make it do it. It is drawing the schematic for the builder. OK, I'm out of metaphors, but you get the idea: you're showing something hidden. Generates a checkbox tag (<input type="checkbox">) in a form. Your options are :disabled, which if set to true, the user will not be able to use this input, while any other key creates standard HTML options for the tag. Calling check_box_tag 'accept' will generate a checkbox tag that will have the id of accept, and the value of 1: <input id="accept" name="accept" type="checkbox" value="1" />. Creates a check box form input tag. - :disabled - If set to true, the user will not be able to use this input. - Any other key creates standard HTML options for the tag. Now the user can evaluate the method's functionality without a lot of verbosity, and see what the method does in real usage. This example-driven documentation style has been criticized, but I don't think you can argue with it. Second, by enforcing standards, you gain usability. It's easy to flip to a piece of documentation and know how to find exactly what you're looking for. This is something that was a big concern for us when working on the Rails documentation because as the documentation stood before, many things could be placed in a disjointed manner (even in the same file or class). One of the best examples of documentation I found was Assaf Arkin's assert_select module. We were doing something very similar to what he was doing before, but we definitely took a few pages from his book and beefed up our standards. The options explanations were in the same place and formatted the same, the examples were always last, and every method or class had an introductory blurb with a general overview of what it did. Following a single convention all the way through makes it incredibly easy to find exactly what you want. All options hashes must be documented somehow. All parameters must be documented in some form. All default values must be explained. Introductory material goes here, where I explain the jist of the method and mention a few key parameters if I need to. * parameter  - Explains all parameters if the list can't be easily explained in the introduction. * option  - Explains all available options, possible values, and default values. I think this is a fair start for most Ruby code, but I'd like your input. Is it too verbose for most cases? Should it be rearranged or compressed? The Ruby Hoedown starts tomorrow! If you haven't gotten your ticket, bounce over to the conference website and register! There will be good talks, good times, and free stuff! Recently I've been working on my Google Summer of Code project dcov (a Ruby documentation analyzer) a lot. It's basically broken into two large functions: analyzing your documentation and reporting on it. I don't have to do much on reporting (thanks Ruport! ), but on the analysis side I'm basically making it up as I go. The first part of the analysis is quantity: is something documented? Right now, this works famously: it can give you a precise precentage of your functional unit documentation coverage. This is easy, of course, because all it has to do is check for the presence of a comment. The second part is quality, and that's where the analysis gets a little hairy. There are no documentation standards for Ruby/Rails really (I'm working on an entry on this...so bare with me), and so I'm sort of left to my own devices when analyzing quality. The plan is to allow users to write their own analyzers and thus let them create their own quality standards, but it would be nice to include a "default" quality analyzer. The problem though is not what it should do, but how? Parameters should at least be mentioned. Options hash must be documented if present. Default values must be explained. A return value description should also be present, if there is a return value and it is not apparent. Let me know what you'd like to see.